When you’re faced with needing a Gilmer residential AC repair, look no further than AC Contractors. 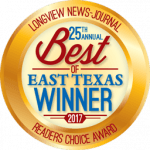 We are the #1 air conditioning and heating company in East Texas thanks to our quality contractors, solid guarantees and competitive prices. Customers know they can trust us for residential air conditioning service in Gilmer TX while backing it up by some of the best guarantees in the industry. The best part is, we don’t charge more for this peace of mind. It’s just how we do business. As long as your AC unit is young and can be repaired, we will recommend the Gilmer residential air conditioning service. However, if your unit is old and inefficient, our contractors can suggest a new installation that will fit your needs. Though air conditioning units are an investment, they are efficient and save money in the long run. Plus, you won’t need all those pesky Gilmer residential AC repairs with a new system! AC Contractors promises to earn your trust. Here are some of the ways that we do this. For reliable Gilmer residential AC repair, maintenance or installation, call AC Contractors. Don’t forget to ask about how you can save money on your utility bills with a cost-benefits analysis!